Javier De La Rosa with De La Rosa & Sons Drywall scrapes the "popcorn" texture off the ceiling at this home. He charges between $1.50 and $2 a square foot. When it comes to houses built from the 1960s to late '80s, nothing says "needs updating" quite like popcorn (aka "acoustic" or "cottage cheese") ceilings. They collect dust and cobwebs, are tough to paint and nearly impossible to clean. And they get the evil eye from real estate agents faster than an avocado or harvest gold kitchen appliance. Removing the rough ceiling finish is within the range of most do-it-yourselfers' skills. But you should know a couple things before attempting this job. Depending on the age of the ceiling, there could be more than bad taste involved. Asbestos, linked to lung and stomach disease, was used in some popcorn ceilings as late as the 1980s. While it was banned for most household use in the U.S. in the late 1970s, businesses were allowed to use existing stocks of the material. Some local drywall contractors say they've seen popcorn ceilings containing asbestos well into the 1980s. "If it was done before 1979, it's almost guaranteed to have asbestos. So anything that's close in there, we have it checked," said Michelle Bentley, office manager for MB Drywall of Tucson. Local drywall companies or homeowners can submit a sample to a lab to determine whether or not it contains asbestos. It's a relatively inexpensive test, from around $25 to $80 depending on how many samples are tested and which lab does the work. "I go by the year. After the late '70s, we don't test," said Javier De La Rosa, owner of De La Rosa & Sons Drywall of Tucson. His firm doesn't touch the older ceiling jobs that contain asbestos. "You have to get people who are specialized to remove that," he said. But even without evidence of asbestos, De La Rosa said his workers wear masks to protect them from the dust generated by the job. De La Rosa is right in that a contractor can't remove popcorn ceilings containing asbestos without following stringent federal Occupational Safety & Health Administration (OSHA) regulations. But, oddly enough, homeowners can legally do it themselves, according to Chrisann Karches, owner of Southwest Hazard Control, a Tucson-based environmental remediation company with operations in California, Nevada, Arizona and New Mexico. "In a home you can do it yourself, but if you hire a contractor, you have to follow OSHA rules," Karches says, which usually means the drywall contractor will subcontract the work to a hazardous-materials firm, such as hers. Karches says the company's workers wear protective masks and clothing, set up a taped-off plastic enclosure with filtered air handlers that maintain a negative pressure inside the work area, keeping air and dust particles from escaping the area. "We get it (the ceiling) wet and scrape it off the ceiling," Karches says. "It gets pretty hot this time of year." She said the cost can vary depending on circumstances, but usually runs from $2.50 to $4 a square foot. That price does not include refinishing the scraped ceiling. And, even if there is no asbestos, there may be more involved than scraping off the ugly coating and repainting the wallboard underneath. That sprayed-on textured ceiling may have covered up some ugly drywall work. After removing the textured coating, there may be nail heads and dents that need to be covered up with joint compound and joints in the wall board that need to be taped, "mudded" with joint compound and finished before the ceiling wallboard is primed and painted. De La Rosa said his crews usually have to apply two layers of joint compound after scraping off the popcorn coating. "That's because when they spray that popcorn, they don't finish the joints," says De La Rosa. The job may not be any neater, but it is less costly when there's no asbestos involved. De La Rosa said he charges $1.50 to $2 a square foot to remove and refinish popcorn ceilings. "It depends on whether it's been painted," he says, because painting the popcorn makes it more difficult to remove. MB Drywall's Bentley said that company prices removal on a case-by-case basis, but typically a 10-foot by 10-foot room would be about $350. "We go out and look at it. It's not a strict square foot charge," she said. There's virtually no demand for putting up new popcorn ceilings, although De La Rosa said he does get calls to touch up popcorn ceilings that have been discolored or damaged. But he said it's tough to match original sections, which are often discolored. 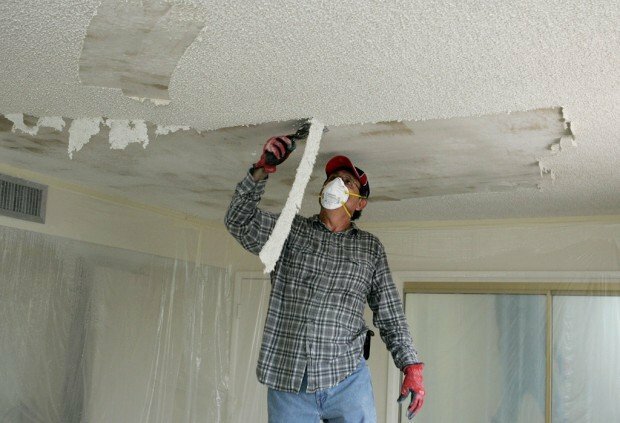 To determine whether or not there is asbestos in your popcorn ceiling, you can send a sample of the ceiling material to a certified lab. It's a fairly simple procedure, says Michael Breu of Fiberquant Analytical Services of Phoenix. "Wet down the sample area with a surfactant, like Windex, Breu says, to keep dust particles from coming loose and being inhaled or entering the airstream. "Use a utility knife and take take a sample; the size of a quarter is adequate. Put it in a ZipLock baggy. If there is more than one sample, number them" so you'll know which room they came from. He said the testing includes the percentage of asbestos in the sample at different levels, from the surface, including paint if it's painted, the popcorn material and the drywall. Breu said about 15 percent of tested samples are found to contain asbestos. Breu said Fiberquant analyzes dozens of home asbestos samples and uses polarized light microscopy, as part of a standardized procedure approved by the U.S. Environmental Protecton Agency. • A tarp or plastic drop cloth to cover everything in the room and enough masking or contractor's tape to seal the tarps and drop cloth sections below the ceiling. If you don't tape off the walls, the water spray used to wet the ceiling may discolor and damage the walls. • A respirator and goggles are recommended. It's a very dusty procedure. • You'll also need to tape off or remove, ceiling light and fan fixtures. • Use a spray bottle or hose with a fine nozzle to mist the textured surface before scraping. Spraying the textured surface helps separate the popcorn from the wallboard and keep the dust down. 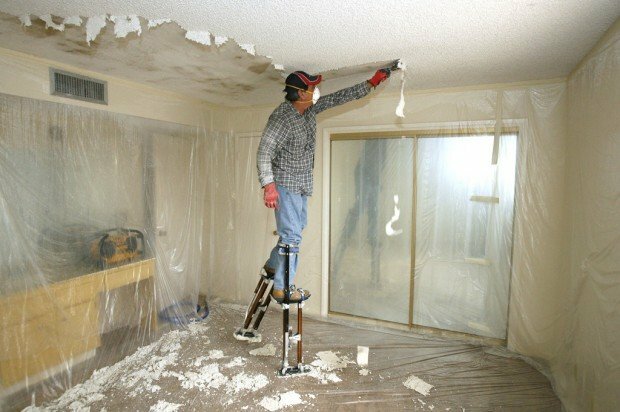 • Use a 4-6-inch scraper, on an extension handle if it's a high ceiling or you choose not to work on a ladder, to scrape the popcorn texture coating from the drywall above it. • Sealable heavy-duty plastic trash bags and large garbage cans are handy for disposing of the dust and debris.